"Peaches are so sweet, juicy, and delicious, and they make a fantastic coleslaw." Whisk mayonnaise, Dijon mustard, Asian chile sauce, lemon juice, rice vinegar, vegetable oil, and sugar in a bowl until dressing is smooth. Season with salt and cayenne pepper. Place cabbage into a large bowl; add peaches and 1 tablespoon chives. Lightly toss until combined. Pour dressing over coleslaw and stir until coated. Cover coleslaw with plastic wrap and chill until flavors have developed and cabbage is slightly softened, about 30 minutes. Adjust seasoning, mix again, and sprinkle with 1 teaspoon chives before serving. 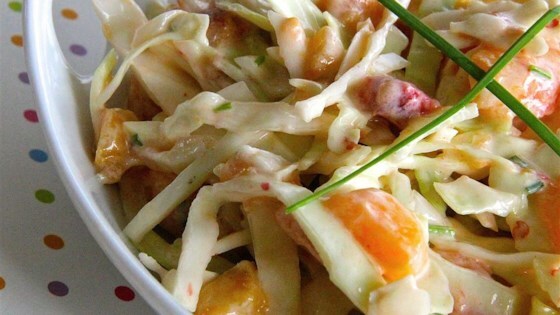 Sweet, juicy peaches make this spicy slaw the perfect summer side. Freestone peaches are easier to prepare. For the dressing, all ingredients are to taste. Just made this for a bar-b-q....It was a huge hit... Something different than the usual cole slaw. I also added toasted sliced almonds on top for taste and contrast. It was quick and very easy. Nice fresh, fruit flavors. Needs a bit of tapioca to hold it together.